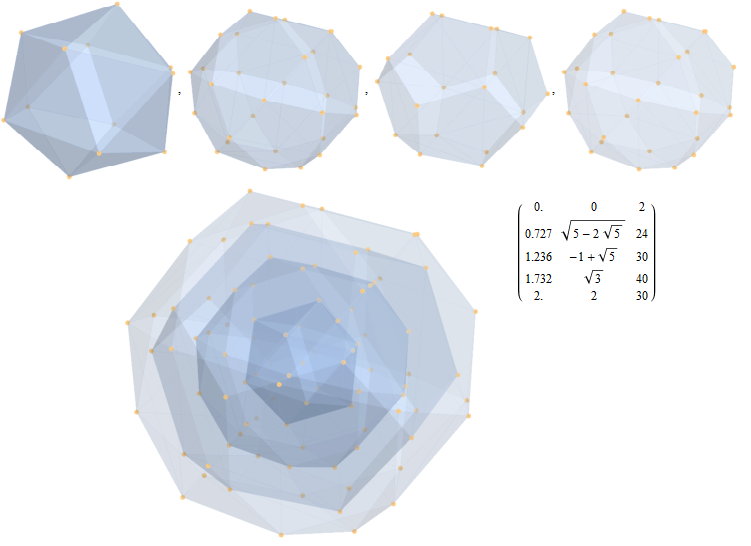 • From the icosahedron to E8. I wrote that post as a spinoff of an article I was writing for the Newsletter of the London Mathematical Society, which had a deadline attached to it. Now I should be writing something else, for another deadline. But somehow deadlines strongly demotivate me—they make me want to do anything else. So I’ve been continuing to think about the 600-cell. I posed some puzzles about it in the comments to my last post, and they led me to some interesting thoughts, which I feel like explaining. But they’re not quite solidified, so right now I just want to give a fairly concrete picture of the 600-cell, or at least its vertices. Points in the 3-sphere can be seen as quaternions of norm 1, and these form a group that double covers The vertices of the 600-cell are the points of a subgroup that double covers the rotational symmetry group of the icosahedron. This group is the famous binary icosahedral group. Thus, we can name the vertices of the 600-cell by rotations of the icosahedron—as long as we remember to distinguish between a rotation by and a rotation by Let’s do it! • 0° (1 of these). We can take the identity rotation as our chosen ‘favorite’ vertex of the 600-cell. • 72° (12 of these). The nearest neighbors of our chosen vertex correspond to the rotations by the smallest angles that are symmetries of the icosahedron; these correspond to taking any of its 12 vertices and giving it a 1/5 turn clockwise. • 120° (20 of these). The next nearest neighbors correspond to taking one of the 20 faces of the icosahedron and giving it a 1/3 turn clockwise. • 144° (12 of these). These correspond to taking one of the vertices of the icosahedron and giving it a 2/5 turn clockwise. • 288° (12 of these). These correspond to taking any of the vertices and giving it a 4/5 turn clockwise. • 360° (1 of these). This corresponds to a full turn in any direction. Good! We need a total of 120 vertices. • Slice 9: a point (the vertex opposite our favorite). Note that there are 9 slices. Each corresponds to a different conjugacy class in the group These in turn correspond to the dots in the extended Dynkin diagram of which has the usual 8 dots and one more. The three legs correspond to conjugacy classes in that map to rotational symmetries of an icosahedron that preserve a vertex (5 conjugacy classes), an edge (2 conjugacy classes), and a (3 conjugacy classes)… not counting the element That last element gives the extra dot in the extended Dynkin diagram. You can click on an image to see its source. The shiny ball-and-strut picture of the 120-cell was made by Tom Ruen using Robert Webb’s Stella software and placed on Wikicommons. The picture of slices of the 120-cell was drawn by J. Gregory Moxness and placed on Wikicommons under a Creative Commons Attribution-Share Alike 4.0 International license. This entry was posted on Saturday, December 16th, 2017 at 1:44 am and is filed under mathematics. You can follow any responses to this entry through the RSS 2.0 feed. You can leave a response, or trackback from your own site. More specifically, I was wondering how that forked diagram corresponds to the linear order of the slices of the 600-cell. Mapping each slice onto the corresponding “leg” of the diagram according to your scheme, we should have: (all three), 5, 3, 5, 2, 5, 3, 5, n/a. Here’s a fun observation: label the extended E8 diagram (legs: 6,2,3) with those nine special conjugacy classes from the Monster: http://www.neverendingbooks.org/DATA2/e8monster.jpg . Count down from 6A to 1A, giving B and C higher precedence: 6A,5A,4B,4A,3C,3A,2B,2A,1A. Now note the legs they lie on: (all three), 6, 3, 6, 2, 6, 3, 6, 6. The extended node (the -1 of Gamma) acts differently. What’s going on here? I was going to pose a puzzle roughly along these lines. My own puzzle was going to be more like this. A finite group has the same number of irreps as conjugacy classes. Usually there’s not a recipe for putting them into 1-1 correspondence. For the binary tetahedral, octahedral and icosahedral groups I believe there is. McKay came up with a way to take the 9 irreps of the binary icosahedral group and create the extended Dynkin diagram using representation theory. (This is well-known, but in case anyone is curious, he gave me a short writeup.) Is there a recipe to create this graph starting from the 9 conjugacy classes in the binary icosahedral group, doing things that it makes sense to do with conjugacy classes? Of course I’d like a ‘systematic’ recipe, meaning I guess that it should also work for all the other finite subgroups of giving the extended ADE Dynkin diagrams. The conjugacy classes in a subgroup of always have a linear ordering, given by their distance from the identity… or if you prefer, their trace in the fundamental representation of (which goes from 2 to -2 as the distance goes from 0 to its maximum value). To me, the problem of correlating the extended Dynkin diagram nodes to the distance of their corresponding conjugacy classes and the identity in seems a bit less crucial than figuring out how the Dynkin diagram edges express some sort of relation between conjugacy classes. It’s a sort of long story, and I haven’t gotten to the bottom of it, but when constructing the minimal resolution of one way is to first construct the minimal resolution of obtaining a space with singularities that look locally like and So, the element -1 in is dealt with in the first stage, and then we think carefully about the vertices, edges and faces of the icosahedron. [L] K. Lamotke, Regular Solids and Isolated Singularities, Vieweg & Sohn, Braunschweig, 1986. [Ki] A. Kirillov, Quiver Representations and Quiver Varieties, AMS, Providence, Rhode Island, 2016. However, I really want to understand this stuff better, which may require redoing it in my own slightly different way. This is a nice description of the 600 cell. It makes me suspect you are secretly thinking of it in terms of quandles! Are you? For example, when you say that in the double cover of the rotation group that a 3/5 turn clockwise counts as different than rotating from the antipodal point by a 2/5 turn clockwise, I know what you mean. But it does sound a bit strange from a pure group perspective, because two elements of SU(2) that project down to the same element of SO(3) really do the same thing to the icosahedron. One way to make this more precise is to realize that there’s a quandle whose elements are vertices of the icosahedron, where the quandle operation just rotates one point around the other by 2/5 of a turn. I like thinking of symmetries of platonic solids (or rather, the double covers of these symmetry groups) using these kinds of quandles! I know, they’re just conjugacy classes of subgroups of spin groups, but the quandle picture is more concrete, for me. I wasn’t thinking about quandles. I was just using the fact that we can specify any element of the double cover of by giving a unit vector in and an angle of rotation . This specification is almost unique: the only thing to remember is that when or it doesn’t matter which vector you use. This is easy to see if we remember that the double cover of is a 3-sphere, which we can think of as a ball of radius with its entire boundary collapsed to a point. But I should try thinking about it in terms of quandles. 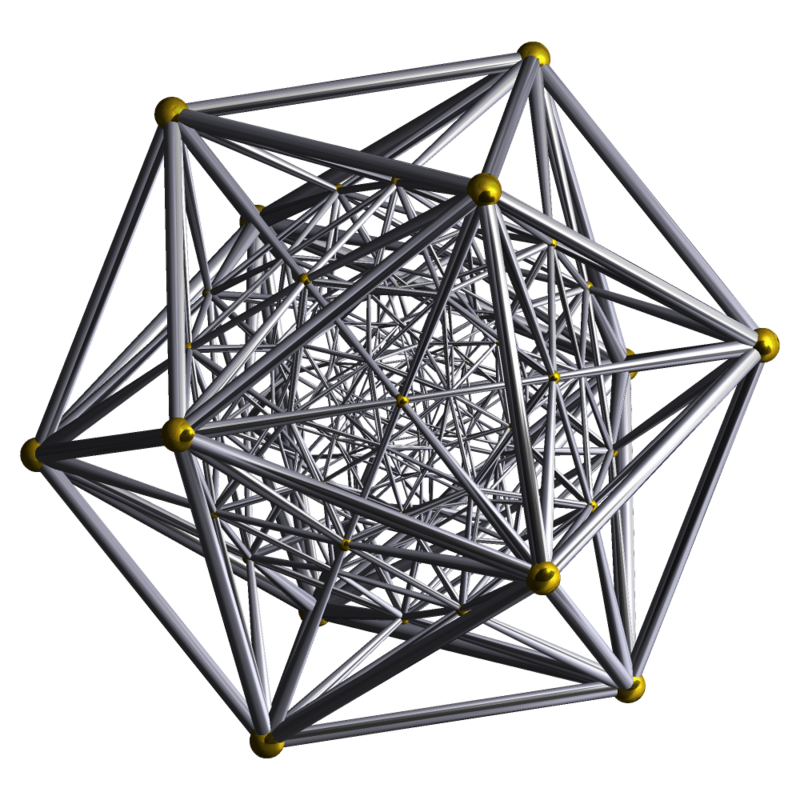 The comment by Adam pointed us to an interesting blog post by Lieven Le Bruyn which describes the vertices of the icosahedron as a 12-element conjugacy class in the symmetry group of the icosahedron (probably the conjugacy class of the rotations by about those vertices! ), and the edges of the icosahedron as a pretty simple relation on the elements of that conjugacy class. This sounds awfully similar to what you’re talking about, though you didn’t bring the edges into the game. Le Bruyn makes it sound like this is something special about the icosahedron, but we should be able to generalize it to any Platonic solid (and perhaps more). That’s right. What I like about the quandle perspective is that it lets you think of certain geometric features of some symmetric object (like vertices, edges, etc.) as being symmetries of that object. There’s a quandle of vertices of any platonic solid, where the quandle operation is just rotation around a vertex by an angle of 2π/n, where n is the number of faces coming together at a vertex. There’s of course a related quandle whose elements are faces, as well as an (involutory) quandle of edges, where the operation does a rotation by flipping the edge around. Better yet, all of these quandles act on each other in an obvious way. The action of the edge quandle on the vertex quandle is probably the relation you were referring to. I’ll have to read that blog post later. I was working with an undergraduate student of mine, Caleb Danner, on understanding such symmetries from an intrinsically quandle-based perspective, without reference to groups. It’s not revolutionary new material, but it’s fun to see how far one can go with this. At some point, I should get some of the things we figured out up on the web. That link just goes to a picture; did you mean this instead? John, We are also quite obsessed with the 600 cell. For one thing, the corresponding discrete Laplacian (nearest neighbors only) has an amazing amount of symmetry, and a lot of properties for the spectrum that resembles the continuum on . Many field theories on are of interest to me, but especially the BMN model, which is essentially N=4 super-Yang-Mills compactified on . Cool! I like the idea of the 600-cell as an approximation to I don’t know about the BMN model. It was all the rage when I was about to graduate from Berkeley. All the stringers were talking about it. It provided a further evidence and elaboration of the holographic correspondence. It would be interesting to compute quantities in the gauge theory from a nonperturbative, numerical approach, which is why a few of us in the lattice community are interested in it. Of course, we’re also looking for excuses to work with curved spaces. I’ll take a look at that paper on the arXiv. I notice that it mentions M-theory and 11d spacetime. This makes me wonder, quite idly, whether you could find an interesting model where instead of the 600-cell you used the root polytope in 7 dimensions, the root polytope in 8 dimensions, or something like that. These have even more symmetries than the 600-cell! For example, the root polytope has 696729600 symmetries. On top of that, the 240 vertices of this polytope correspond in a very sneaky way to two copies of the 600-cell’s 120 vertices. But, I don’t have any concrete ideas of how you’d get a higher-dimensional field theory and discretize space to be one of these delightful higher-dimensional polytopes. It is interesting to show how the 8 slices of E7s concentric hull projection are represented in the 18 (9×2 H4+H4Φ) slices E8’s concentric hull projection. You can even do the same with E6 which shows an icosahedron and dodecahedron from the 6-demicube and 2 irregular 20-vertex polytopes from 40 of the 60 D6 vertices, for a total of 72 vertices. We can check that the 120 vertices of the 600-cell form a group under quaternion multiplication. As mentioned in Part 1, this group is called the binary icosahedral group or because it’s a double cover of the rotational symmetry group of an icosahedron (or dodecahedron).